Ah, after two years we finally get our hands on one of the first major game Kickstarters I ever backed. This was the second project I ever backed on Kickstarter. When I heard Tim Schafer was gonna do a new point-and-click game, I knew I had to back it. Apparently, I wasn't the only one because it was a huge success and was the start of a multitude of gaming Kickstarters that became quite a success themselves. 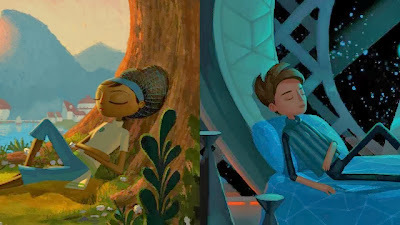 Of course, the Double Fine Adventure Game would become known as Broken Age and that's what I'm going to talk about here. I completed the game last night and it was everything I hoped it would be. I'm not gonna be specific about any aspect of the story or plot since it's an important part of the experience. I will mention what I thought of the worlds and characters. The world and locations are very surreal and strange and yet very familiar. The main characters themselves are very grounded and personable. The various NPCs you meet are very odd yet likeable. I found every character to be endearing and very charming. Even characters that only appear for a few scenes were great. Some of the jokes and sexual innuendos were really clever and made me laugh out loud. While the game is incredibly whimsical, there's also a sinister aspect which I won't get into. There's something going on with the world and it's quite intriguing. I was quite surprised with the plot and since this is only the first act of two acts, a lot of questions haven't been answered yet. It's a really nice taste of things to come. This is your standard point-and-click game but with essential elements simplified. First thing that I noticed was how incredibly slick the UI was. You get your menu up top while the inventory is at the bottom. Any long time adventure fans will grasp the mechanics in an instant. It's so simple that the game doesn't even give you any tutorials. You're simply dropped into the game and learn to discover what you can do. It's very intuitive. The puzzles were also very simple and easy. I only had two or three spots that took a bit of exploration and experimentation to figure out but this game was super easy. Tim Schafer's previous games usually had a few brainteasers that required a guide for me but not here! The solutions to the puzzles felt natural within the context of the world. The game gives you plenty of hints from within the dialogue so it's relatively painless to solve. Even if you were stuck, you could experiment with different objects in your inventory or explore around and it'll click. The game has no failure states or dead ends which was a relief. I can understand that some old school adventure fans might find the puzzles too simple but I thought they were well designed. The way they were implemented into the world made sense. I'm not into puzzles that try to scramble brains and Broken Age manages to avoid that issue here. One word: WOW. The 2D art was gorgeous. I played on a 2560x1440 resolution and the game was super sharp and colorful through out. Characters were really well designed and cute. They animated really well too. It was like playing a storybook from my childhood. The art direction was beautiful. There's no other word I could describe it. The audio was equally amazing. The voice-over was excellent all around. Everyone gave a strong performance. I didn't find anyone grating or annoying. You should check out the voice cast after you're done. You'll be surprised who they got to do the voices. The music was also great. It added to the whimsy and was very atmospheric. Really great soundtrack. This is one of the most refined and well crafted modern adventure games out there. The simplified interface and gameplay will allow both old and new adventure game fans to enjoy it equally. Really intriguing story with a lot of great characters. The wait was worth it and I can't wait to see how it ends in Act 2. Definitely a must play if you like Tim Schafer's games or adventure games in general. Definitely worth checking out.